I think I am going to wear a sign around my neck. The reason is simple. The question “Is Netanyahu going to attack Iran?” is becoming so frequent that I am getting tired of answering it over and over again. I have never seen such hysteria in Israel. I have friends having nightmares about a possible war, others who are asking me whether they should go and stay with their families abroad this summer until “after the war”. Others who are abroad asking me whether its safe to come back. 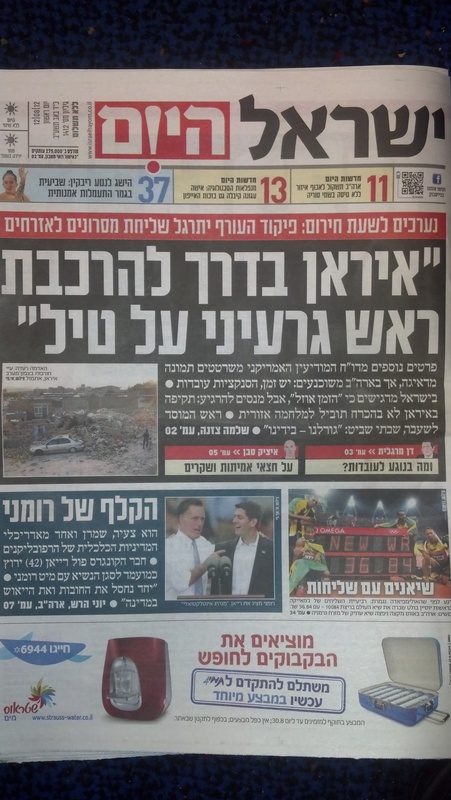 Meanwhile the pro-government publication Yisrael Hayom (owned by Prime Minister Netanyahu supporter Sheldon Adelson) is whipping up the war fear. This free newspaper which is Israel’s most read publication seems to be going out of its way to drive the public into a war frenzy. A good example is its 12th of August its front page (snapshot included) which read “Iran on its way to install nuclear warhead on a missile”. Its source? Reports from American intelligence. The headline is totally inaccurate and utterly sensationalist. Iran does not have a nuclear weapon to begin with. Never mind having one which is now advanced enough to be placed on a warhead. No wonder people are losing sleep. Or another detail included in today’s weekend edition of Yisrael Hayom. Under the headline “American Chief of Staff: I don’t want to join an Israeli attack” it says “Morsi to Ahmadinejad: we are strategic partners”. Not a word about Morsi attacks against Iran’s ally Syria on Iranian soil in front of thousands of delegates at the NAM conference on its front page. Or how Iran and Egypt have major differences and that in fact there is no chance that they will have embassy level relations anytime soon, never mind a “strategic partnership”. Iran is a threat which no Israeli leader could ignore. Even if Yitzhak Rabin were alive today he’d have to address it. My concern is that the constant threats of war by Prime Minister Netanyahu’s government is causing damage to Israeli society and economy, without Khamenei having to lift a finger. The Israeli government seems to be handing a victory to the Iranian government on a silver platter. For now I am going to consider making that sign.